Nokia is a well known brand which had been very famous in the field of telecommunication and mobile devices. Nokia was one of the biggest manufacturers of mobile phones but it sold its device and service department to Microsoft. Nokia Lumia 1320 was launched in October 2013 and was released in 2014. The phone is with a high touch screen display and with a good resolution. The price of the phone ranges from Rs. 18000 to Rs. 20000. The phone runs on a Windows 8 platform and has a great non removable battery. The features provided by the model are the best in comparison with the phones in same range. The phones are available in many colors and it is available online at discounted rates. Nokia is owned by Microsoft and the devices developed by them are not using the Android platform. The phones use the Windows as the operating system. Nokia Lumia 1320 uses the Widows 8 as the operating system. The height, weight and thickness of the phone are 164, 85.90 and 980 respectively and it weighs 220 grams. It has the non removable battery of 3400 mAh which is considered as a great battery and its life. For those who use the phone continuously this phone is most suitable. The software is quite different and better as it is the commonly used platform of Windows. The software that is developed by Microsoft is available free on the model. The phone comes with some pre installed software. The daily object coupons can be used for the latest information on prices of smartphones. The processor of the Nokia Lumia 1320 is 1.7 GHz dual-core. It uses the Qualcomm Snapdragon 400 processor. The RAM of the phone is 1 GB and it has an internal memory of 8 GB. It offers to extend the memory up to 64 GB using a micro SD. The storage capacity provided by the phone is sufficient and it also provides a good external memory. 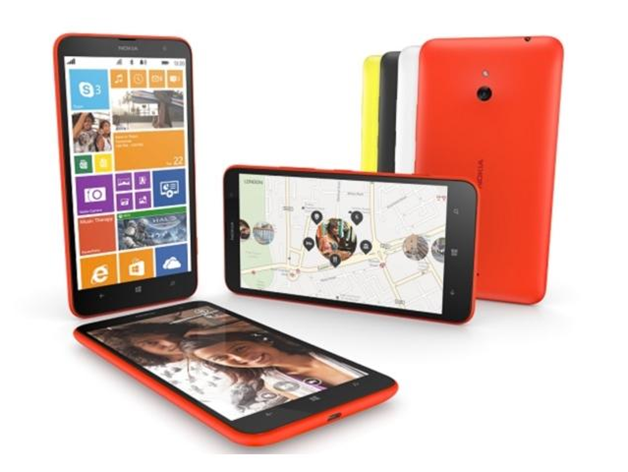 The Nokia Lumia 1320 has a display screen of 6.00 inch and so it is considered as a phablet. The resolution of the phone is 720 pixels X 1280 pixels. The resolution is quite good and it helps in viewing the images and other multimedia in a better way. The density of the resolution is also very good at 245 PPI. The display screen is quite large and it makes easy and comfortable to view the images and videos. The phone has front and rear camera and the rear camera has a 5 megapixels and the front camera has 0.3 megapixels which can be used for the purpose of selfies. The camera can be considered as a disadvantage as the megapixels is a bit low and it may not be able to generate high quality images. You can use the EBay India mobiles coupons to get the phone. It is a single SIM smartphone that has other connectivity features such as WIFI, Bluetooth, FM, $G and the sensors such as Accelerometer, ambient light sensor and proximity sensor. It also has another sensor which is compass which is not found in other smartphones commonly.